Fleetwood Mac played 65 shows in 2013 (67 when you include the two upcoming Las Vegas shows), 47 in North America (49 when the Las Vegas shows are included) and 18 in Europe. 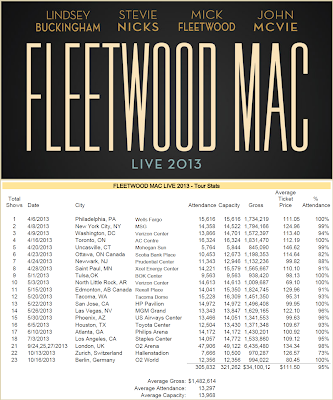 The below numbers are based on 45 shows reported to Billboard Boxscore between November 14, 2012 and November 12, 2013. Boxscore numbers solely depend on the consistency and accuracy of reports from promoters, venues, agents and managers. Average Per Show Gross: $1,375,543. This isn't fair. They should've had the total gross from the 65 shows not just the 45 so the gross would probably be near $90,000,000. They should've ranked much higher than 17. Why aren't all the shows listed? None of the Europe shows are included in this total and two are missing from the U.S. This isn't fair!!! This is their most successful tour to date but nobody knows this because the figures are missing. They grossed nearly $6.5 million dollars just from the three London shows for God's sake!!! Although it might not have made them the most money I couldn't see an empty seat at their first Dublin show on 20 September! Ticket prices were decent, thankfully!